With this fun new method, you, your church or school can permanently memorize these passages and psalms. It's so enjoyable and meaningful to everyone. Recall them easily. Click the video to learn how. “A solid $35.00 method any seminary professor/teacher could use to instruct their students to memorize scripture permanently in ESV and NKJV." Purchase one of our 60, 3 x 5 banners to display on your classroom wall made of high quality vinyl. In class the students then hear the CD of the tune as they follow the words on the banner. After hearing the tune several times, they will be able to say passage as well as sing it and remember it permanently. Your first banner and cd with over 10 songs is $35.00 shipped to you. We give a 30 day money back guarantee if not completely pleased. Your students and church will love it! The MyMemoryVerse cadet program is a wonderful way your students to receive rewards like the boy and girl scout program while they learn the essential bible passages. 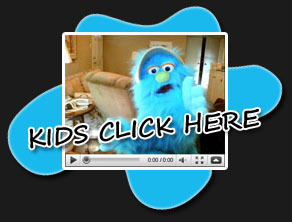 Your young students can listen to STUMPY sing to them and enjoy his special "Dear Stumpy" section or visit him FACEBOOK. He answers their questions.